Spectacular Views, Incredible Luxury, Beautiful Decor! 4/4.5 Corner Condo at Turquoise Place! Orange Beach home steps to the beach! Large decks, spacious floor plan, upgraded interior! 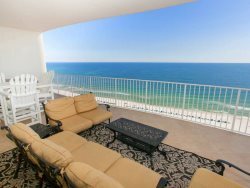 Orange Beach Gulf Front Home: Wraparound Decks, Costal Decor, Pool and Tennis!